Can a military confrontation be averted? Tension is running high between the United States and North Korea, a family-run communist dictatorship with a record of horrific human rights abuses. 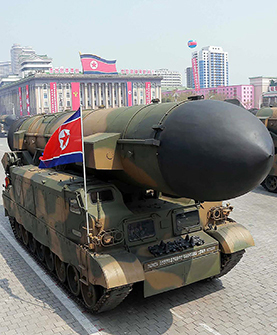 One of the world's most militaristic nations, the “Hermit Kingdom” is testing increasingly powerful nuclear bombs, seeking to develop ballistic missiles capable of reaching the United States and threatening U.S. ally South Korea with a massive arsenal of artillery and other weapons. After years of attempts by U.S. presidents to rein in North Korea's nuclear ambitions through negotiations and ever-more-stringent economic sanctions, the Trump administration is vowing to eliminate the North Korean military threat. President Trump warns of the possibility of a “major, major conflict” with North Korea, and administration officials say they are considering all options. Neighboring China and Japan fear a full-scale regional war, and South Korea's new government — fearing that tens of thousands of its citizens could die in a war with the North — wants a more conciliatory approach in dealing with Pyongyang.